Alleged corruption, an open can of worms at M.W.T.I. Last week, the investigation into claims of corruption at the Ministry of Works, Transport and Infrastructure (M.W.T.I.) took an interesting turn. While the initial allegations were raised by a former Member of Parliament of India, Sh.P.K. Bansal and his company called Ascent Navals against the Ministry’s Chief Executive Officer, Afamasaga Su’a Pou Onesemo, it emerged there was a lot more than meets the eye. You see, upon receipt of the letter containing allegations of corruption from Mr. Bansal, which was addressed to the Chairman of the Public Service Commission (P.S.C.) and copied to this newspaper, the Government reacted right away by suspending Afamasaga and launching an investigation involving the Office of the Attorney General and the Police. But then another interesting development unfolded. A letter dated 15 June 2018 signed by P.S.C’s Delegate, Maiavatele Timothy Fesili, landed. It outlined P.S.C. charges against the Assistant Chief Executive Officer for the Maritime Division of M.W.T.I., Fepulea’i Mark Alesana. He faced six P.S.C. charges over his alleged connection to the Indian company, which accused his suspended superior. Right away you get the feeling that this is a can of worm that had just been busted open and it was. The first charge against Fepulea’i alleges that he failed to disclose and take reasonable steps to avoid any real or apparent conflict of interest in relation to his employment as the A.C.E.O. for the Maritime Division at the M.W.T.I. The second charge alleged that Fepulea’i asked or accepted monetary gifts from Ascent Navals. The third charge accuses the A.C.E.O. of failing to seek approval from P.S.C. with respect to his occupation outside the Public Service. Another charge alleges that the A.C.E.O. failed to act in an honest and impartial manner. Fepulea’i was also accused of failing to act with integrity, misusing his authority and failing to comply with all lawful and reasonable directions given to them by persons who have authority to give those directions. On top of the charges, another document arrived. This time it was a copy of the Ascent Navals registration with the Ministry of Commerce Industry and Labour. It showed that Fepulea’i is one of the Directors. The other Directors are Jaspreet Kaur and Suniel Kumar Sharma and all three of them own 200 shares each. These are serious allegations. And as a newspaper, it is only fair that we give the opportunity to the person accused to comment. Interestingly, when the Sunday Samoan contacted Fepulea’i, he denied that he had been suspended. Well that says a lot, doesn’t it? Obviously there is far more than meets the eye in the inner workings of the M.W.T.I. echelons and maybe, just maybe we are only starting to get into something a lot deeper. Keep in mind that Fepulea’i and Su’a are not the first public officials to be accused of corruption and conflict of interest. These allegations are the latest in the long history of claims of unbridled corruption and blatant wrong doing uncovered from time to time. Now two days ago, it emerged that the P.S.C. has terminated the services of Fepulea’i. This was confirmed by the Minister of M.W.T.I. 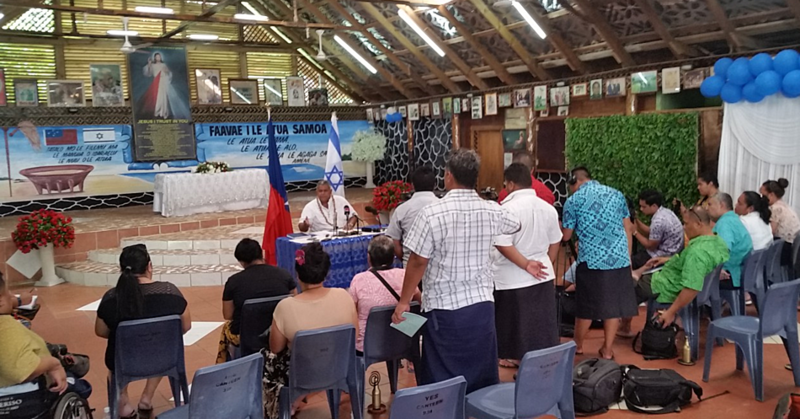 Papali’i Niko Lee Hang who told the Samoa Observer that the A.C.E.O. had attempted to tender his resignation. This was rejected and he was sacked instead. “I also support the decision by the P.S.C. to terminate his services, due to the severity of the matter,” said Papali’i. “I support the recommendation by the P.S.C. and even if they refer the matter to the Attorney General’s office for his review, whether the matter is sufficient for criminal proceedings and that is their perogative and well within their authoritative lane. The Minister added that if it is proven there is misconduct leading to corruption, he would support the move to refer the matter to the Office of the Attorney General and the Police for further investigation. As for the initial investigation against the suspended C.E.O., Papali’i said this is ongoing. Have a peaceful week Samoa, God bless!